St. Martin's Griffin, 9781250022028, 288pp. Mikey Walsh was born into a Romany Gypsy family. They live in a secluded community, and little is known about their way of life. After centuries of persecution, Gypsies are wary of outsiders, and if you choose to leave you can never come back. This is something Mikey knows only too well. Growing up, he didn't go to school, he seldom mixed with non-Gypsies, and the caravan became his world. It was a rich and unusual upbringing, but although Mikey inherited a vibrant and loyal culture, his family's legacy was bittersweet, with a hidden history of violence and grief. Eventually Mikey was forced to make an agonizing decision—to stay and keep secrets, or escape and find somewhere to belong. Gypsy Boy shows, for the first time, what life is really like among the Romany Gypsies. A surprise #1 bestseller in Great Britain, this is a one-of-a-kind memoir of a little-seen world, one both fascinating and heartbreaking. MIKEY WALSH left the Gypsy community and moved to London. It is the longest he’s ever stayed in one place. He taught himself to read and write and now works at a primary school as a teaching aid and also picks up the formal education he missed out on as a child. 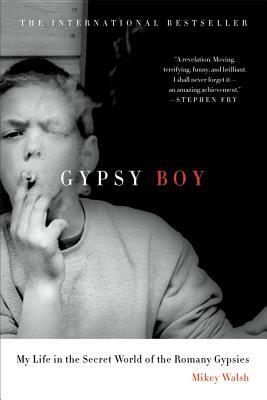 He is the author of the internationally bestselling memoir Gypsy Boy.